A dizzying number of transportation-related proposals centered on Detroit's mid-continent location are floating around Michigan. They have funny names (Aerotropolis), links to faraway locales (Halifax, Nova Scotia) and impressive engineering goals (a rail tunnel tall enough to handle double-decker cars). One common thread through most of these proposals is a need for investment. The ideas are outracing the dollars. Michael Belzer, a Wayne State University economist leading a concept to link Detroit with Halifax by rail, said last December that a hurdle to a Michigan opportunity was the "reluctance" of the Michigan Economic Development Corp. to provide the money necessary to start the work. With little in the way of progress detected in recent months, Bridge asked MEDC's director of policy, Peter Anastor, to give its views on the various "multimodal" proposals around Detroit. Bridge: What is MEDC's official position on the following proposals: The Great Lakes Global Freight Gateway; Aerotropolis; Continental Rail Gateway? A: Michigan is working to leverage and promote all our significant assets in order to become a global transportation, distribution and logistics gateway. To accomplish this, we will need to prioritize the opportunities and identify barriers associated with various types of infrastructure and (Transportation, Distribution and Logistics) projects. Any project that strengthens our assets is certainly important to Michigan and will receive consideration for support as we further develop our vision. Bridge: A major rail expansion was just announced in Toledo -- $160 million for rail yard improvements that could lead to 275 jobs. Does this announcement make it more or less likely that proposals for SE Michigan will move forward? A: One of Michigan’s assets is our connection to global infrastructure networks. We will make decisions on projects based on the capability to extend our connections to global markets or to make our system more efficient. Key to this will be ongoing efforts to form partnerships that can bring about a successful and efficient TDL system for Michigan. 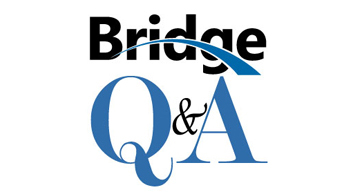 Bridge: What are the principal hurdles to attracting more freight business through southeast Michigan? A: The greatest hurdle currently is a lack of a clear, coherent and unified vision to leverage our TDL assets. In addition, we need to ensure an inter-connected TDL system that efficiently links to global connection points in order to increase freight volume and reduce costs. Bridge: The NITC project has drawn the lion's share of transport attention in Lansing in recent years. Why do you think the Michigan business community has not taken to the airwaves to counter the Moroun family's opposition to NITC? A: We have overwhelmingly widespread support for the NITC from the business community, with all significant business stakeholders (except DIBC) backing the NITC. Bridge: Would MEDC favor the creation of a "super" transportation board to oversee the existing entities in southeast Michigan -- Detroit Airport Authority, Port of Detroit -- and focus efforts on a broader multimodal freight strategy? Why or why not? A: For Michigan to become a global transportation, distribution and logistics hub, we will need to find ways to leverage our assets and develop an efficient system to move goods and people. The specifics of how to create the most efficient system have not been developed, but all options will be explored to ensure we are well-positioned for success. Bridge: Can Michigan successfully pursue multiple freight hubs? MEDC has given support to the I-69 corridor effort -- is the Flint/Port Huron area a better fit for a freight hub than SE Michigan? Why or why not? A: The I-69 corridor effort is one of four Next Michigan Development Corporations that have been approved by the state. The Next Michigan Development Corporations are important because they provide additional tools that are clustered around significant TDL assets in Michigan. The other three are in the Lansing region, Traverse City region and Detroit/Wayne County region. Bridge: If you could communicate only one idea about freight economics to Michigan taxpayers today, what would it be? A: Michigan has an array of existing assets that can be leveraged to develop our state as a global transportation, distribution and logistics hub. This will lead to more jobs and greater investment in our state. The key will be to develop a unified vision and efficient TDL system that will connect our businesses to the global economy. It did not appear you got a single straight answer to your questions regarding the priority of getting a Freight Hub completed. I see the combination of transportation infrastructure investments as key to seizing our location advantage we have. We are on the path of a significant freight corridor, which if we don't prepare for it, the freight will go around the state. If we won't capitalize on our existing assets that no one can take away, what will we invest in for our future economy and jobs? Rep. Olson, Thanks for reading -- and commenting. I cannot disagree with your assessment of the answers. If there's any single takeaway from MEDC's response, I think it would be that they either aren't agreed on a focused approach to the concept -- or are simply unwilling to share it with the public at this point. Either way, it's frustrating. Thanks, Bridge, for engaging MEDC! There is agreement that the opportunity is great. Leadership must now brainstorm the "clear, coherent and unified vision" we are all challenged to input on -- so that an output of prioritized of starting points is delayed no longer! For there to be a functioning WHEEL (to not just Michigan but a "heartland" that includes Toledo and up to a 300 mile radius), one must have a HUB. For Detroit-Wayne to be the GLOBAL hub realizes SE Michigan's greatest potential. Besides Toledo as a major spoke or spur, the I-69 corridor is obviously another (running to and thru Lansing, of course). Centralizing freight through the HUB with greatest potential for scale (volume) is where long term efficiency is most likely. Perhaps an emphasis on people and tourism is more logical for Port Huron, with its growth not only via business spurs through "the HUB" but by Pure Michigan service and destination developments that the world also seeks (and can even be tied to Traverse, by water or across land). These are the same hollow words that various pundits, public and private have been spouting for decades. There is and has always been a large fly in the ointment forever, a "Moroun" fly. Obnoxious and persistent. And now you know why any development of an international, intermodal logistics hub will require the majority participation of one company or nothing will ever get done. Is there any doubt to why SE Michigan will not be an intermodal transportation hub. My question is how did this person get their job, who made that decision, for they are the ones to be held accountable. MEDC has a problem with leadership. As with any political agency, it is difficult to find the person responsible for decision making because that goes along with accountability. How easy it is to manage by committee. Nobody wants to fail but no one wants to make the up-front financial investment to insure success. Everyone thinks its a good idea but if national policy is to reduce our reliance on petroleum by pricing, is the over the road trucking industry in for a major overhaul as rail becomes a more efficient shipping mode? The market has been spoiled by the distribution system in America and if some have their way, instant delivery will be sacrificed for low cost shipping. It appears the postal service is ready to cut service based on costs, so the sacred cow of USPS is approaching the alter.